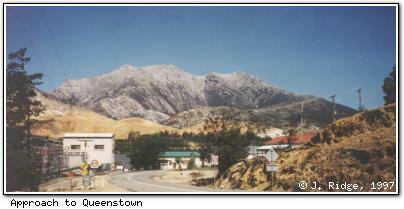 Queenstown (pop ~3400) is the largest town in western Tasmania. The mine at Mt. Lyell has sustained Queenstown since the late 1800's when gold, silver and copper were discovered. Queenstown sprang up in no time as a typical "frontier town", but in recent years has been somewhat more subdued, with the future of the Mt. Lyell mine repeatedly being questioned. In 1995, it was decided to continue mining into the next century, relieving some economic pressures. The hills around Queenstown were stripped of timber to fuel copper smelters, and rain subsequently eroded the soil, leaving the purple and gold rock exposed. The strangely naked mountains are quite a sight from the highway going into Queenstown, and in the evening can provide for spectacular photographs. Over 20,000 kg of gold has been mined at Mt. Lyell since 1888. Tours of the mine are available (although expensive) and include a visit to the mine face. Within Queenstown, the Gallery Museum has historic photographs and memorabilia from the west coast's heyday. There is a chairlift which affords patrons a view of the denuded hills. Just east of Queenstown is the original Iron Blow open cut goldmine, and the ghost town of Linda. At Lake Burbury, the Newall Creek Rainforest Reserve has a viewing platform and signs pointing out the various native pines. To the west, it is possible to walk along the disused mine railway to Zeehan. Queenstown is approximately a 4:00 drive from Hobart, 3:30 from Launceston and 2:30 from Burnie. It has one 3½-star and four 3-star accommodations (RACT rated), plus backpacker facilities. Mt. Lyell Mining and Railway Co.